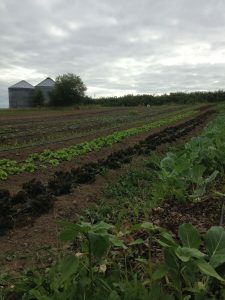 Since Oregon Farm Link (previously iFarm) began connecting beginning farmers to land in 2009, Oregon’s landlink program has made more than 70 successful land matches across the state. We are beginning to collect our success stories and share them here. Check the page regularly as new testimonials become available! 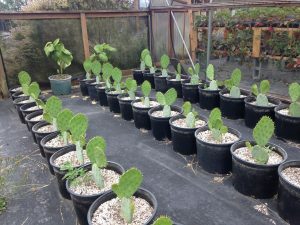 Yamhill County’s major agricultural products include berries, tree nuts, and nursery stock…and if Javier Lara has his way, nopales, or edible cactus pods, will soon be added to the list. It’s early on a Tuesday morning, and I am strolling through the newest property for Anahuac Produce. Javier directs me to a row of small greenhouses, some filled with strawberries and others with cucumbers and tomatoes. “Try this!” he says, pointing to a large, heart-shaped leaf. I nibble on the corner of a hoja santa plant, delicious and unlike anything I’ve ever tasted: a mix of anise, cilantro, citrus and eucalyptus. It’s important to Javier to cultivate these plants from his native Mexico, and he is excited to have the opportunity to share them with others. Javier was a farmworker for several years when he first came to America, experiencing first-hand the challenges of that work. He then spent years working as an organizer for PCUN. Based in Woodburn, PCUN (Pineros y Campesinos Unidos del Noroeste, or Northwest Treeplanters & Farmworkers United), is Oregon’s only farmworkers union, as well as the largest Latino organization in the state. At PCUN Javier worked closely with Oregon’s farmworkers, empowering them to take action against the systematic exploitation so often present within the agricultural labor system. After exploring the reality of many of America’s farmworkers through his tenure at PCUN, Javier wanted to have the experience again, with a different perspective, as an organizer. This is why he founded his own farm: Anahuac Produce. Anahuac Produce is guided by 4 core values. Javier is dedicated to socially and environmentally sustainable production, raising his produce organically and supporting fair and just labor practices by partnering with PCUN’s union workers. The word Anahuac, Javier explained to me, is an indigenous name that refers to the ancient core of Mexico, and likewise tradition is extremely important. As we walked through the farm, Javier showed me the spot where he roasted lamb in celebration of the farm’s creation, and the small altar where he made traditional offerings before breaking ground in the fields. He consults elders to learn the traditional methods of farming, working to ensure that the cultural and agricultural heritage of his people is not forgotten. The crop selections at Javier’s also echo this commitment to tradition. 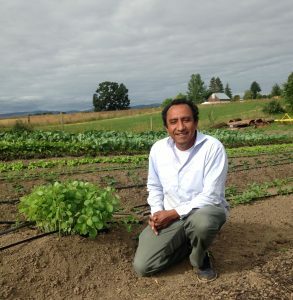 He is dedicated to cultivating unique vegetables from his people that are often difficult to find in Oregon: the juicy pads of nopal cacti, herbs like papalo, and many varieties of peppers. Javier explains how shoppers enjoy trying these new vegetables: a cultural bridge. Finally, Anahuac Produce feels it is essential to share freely and generously the knowledge that they have gained with fellow farmers, supporting the growth of similar operations throughout Oregon. Now in its third year, the farm began with two acres of organic berry fields in Molalla. When Javier decided he wanted to expand the operation, he began to search for land on Oregon Farm Link. As soon as he met the owners of his current site, Kathy and Rick, it was clear that it was a match. Although the land was fallow, there was much potential! Javier began his work in earnest there this winter, clearing fields and creating beds, building a propagation room to start the heirloom seeds he’d brought back from Mexico, and retrofitting greenhouse structures onsite to provide shelter to tomatoes, cucumbers, and strawberries. As Javier excitedly discusses the plans he has for the future, it’s hard to believe he’s only been growing at this site for several months. In an unexpected twist, Javier is currently in the process of facilitating yet another Oregon Farm Link match! Javier has been working closely with a local youth over the past year, whom he met through his work with PCUN. Javier immediately noticed this youth’s interest in agriculture, and offered him more responsibility at Anahuac. Within several months, the young man told Javier he had created a profile on Farm Link and found a new property in Brooks where Anahuac could expand their organic berry production! This seems like a natural progression from someone whose business model is predicated on freely sharing information and experience. What gnaws at us all is the regret of an unlived life. We have every opportunity and ability to pursue our passions to the fullest, but too often fall victim to procrastination. It affects us all, some of us it cripples. Those who do wake each morning and do exactly what they want are envied, glorified, even studied. But they are merely doing what they love. The world is a better place when someone finds that which keeps them up each night and rouses them from bed every morning. For local long-stem flower farmers Lindsay Goldberg and Courtney Brooks—owners of Fawn Lily Farm—finding time for such contemplations may be difficult. 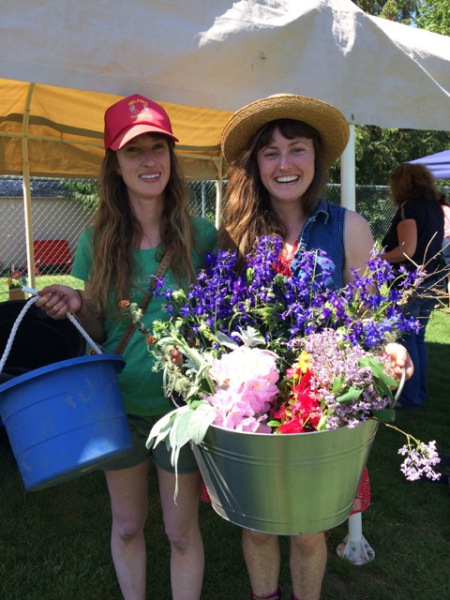 The native California gals recently begin their second year as Oregonians and their second season as professional flower farmers. Within mere months, the flower duo was able to turn an idea hatched in a California craft fair into a viable and profitable flower and herb farm in the green hills of Corbett, OR. With no business plan, no long-stem flower experience and no connections, the peddlers moved to Oregon and began what they call their grand experiment: learning how to run a small business while dealing with the setbacks and self doubt associated with mastering a new skill. They are farming a half acre with a hoop house on a 20-acre plot, most of which is forested. The Fawn Lily women’s growing process is centered on locally-adapted, open pollinated, pesticide-free growing. These practices suit the owners of the land, Michael and Pam, just fine– they had been looking someone with a similar ethos for some time. The group was brought together with the help of iFarm Oregon—a program created by non-profit Friends of Family Farmers—which links those who have land with those that need it. I am not dead, but there is no certainty that I’ll even finish writing this profile, let alone start a cattle operation. Fawn Lily, in their first year was selling flowers in New Seasons. They gained favor of New Seasons’ buying manger as they left her message everyday until “she eventually replied with, ‘How many of you are there?” Fawn Lily’s blooms showed up in a few stores last year and will be in more store locations in 2016. An accomplishment of note is their recent inclusion in the Portland Flower Market, which is Portland’s wholesale “farmer-to-florist” market. This move will give Fawn Lily’s product constant exposure to buyers in a very competitive field. “We have to specialize in a niche that the fresh cut flower industry can’t provide. [We] try to get people to think about the idea of slow flowers, that origin matters, and the true cost of flowers.” Courtney also mentions that it is nice to not to have to be at the Portland Flower Market in person in order to sell their goods. It’s not easy to find one’s life task, let alone have the courage to pursue it. Courtney and Lindsay created Fawn Lily Farm through action and acceptance of the unknown. A good lesson for us all: always listen to that voice in your head. She ain’t always right, but she’s never boring. While touring the property leased by Nathan Moomaw, founder and farmer of Moomaw Family Farm, it is easy to observe the freedom that his animals experience. His chickens chase one another and cluck their gossipy tidbits. Nathan pets an affectionate sheep while explaining how this breed sheds naturally in spring so it stays cool in the summer months. The pigs are playful at all ages and are exceptionally interested in nuzzling and nibbling my toes. A native Oregonian, Nathan Moomaw lived the city life in Chicago as an audio engineer before moving to an alpaca farm to work as the caretaker from 2003-2005. His agricultural interests and connections burgeoned while caretaking the farm. Nathan eventually relocated to Milwaukie, Wisconsin where he began working with CSAs and direct market vegetable farms, tending stands at as many as five markets per week. Nathan’s experiences working with Community Supported Agriculture (CSA) business models were formative to his current business strategy. He appreciated the select and direct customer relationships CSA operations create. In the CSA model, customers “buy a share” of the farm’s produce in advance. This allows the farmer or rancher to plan production to meet a known goal and helps with cash flow by providing funds at the beginning of the season, when they’re most needed. Nathan also witnessed the repetitive nutrient loss intrinsic to vegetable production: crops collect nutrients from the soil; those crops then store hard-earned nutrients in their fruits, leaves, and roots, which are transported from the farm to mouths in cities. After being consumed or discarded, those nutrients are wasted – flushed away as sewage. By choosing to raise meat for his CSA, Nathan hoped to do a better job of closing the nutrient loop. His system is one where livestock consume essential nutrients from the pasture and then metabolize those nutrients, ultimately depositing them back into the same pasture as fertilizer for future growth. Inspiring Nathan’s farming ethos is a “simple but powerful” quote in the book, The Little Prince: “You become responsible forever for what you’ve tamed.” Nathan explains that, “the human tendency seems to be to control, manage, and improve nature, which is okay; however, every time we make a decision to go in that direction, we are replacing a natural system, one that was sustaining and managing itself, with an artificial system, a system that we are now responsible for maintaining.” From my visit to his farm, it is clear that he assumes this responsibility seriously. Once back in the Pacific Northwest in spring of 2012, Nathan began his search for land. To his great fortune, Nathan struck a chord with the very first property he visited. What appealed to Nathan most about Drizzlewood Farm (located just outside of Molalla) were the farm’s 300-year-old oak trees, which could provide an annual crop of acorns that his pigs would happily consume. Harlan Shober, one of Drizzlewood’s owners, had been in contact with several other iFarm landseekers before he met Nathan. Because Drizzlewood’s 100 acres are beyond Nathan’s start-up capacity, Nathan and Harlan created a variable-cost lease where Nathan’s lease payments vary depending on the amount of livestock he runs. By paying only for the land he uses, Nathan can conserve his financial resources. This agreement also affords the CSA plenty of room to grow – something that Moomaw Family Farm will surely need. The CSA sold all 65 of its initial shares and there is a waiting list. Currently, the Moomaw meat CSA offers chicken, lamb, rabbit, and pork. Nathan hopes to add beef to his offerings in the future. With the average age of Oregon farmers at 58, there will be a mass changing of hands of farmland in the next two decades. The future of Oregon agriculture will rely upon landholders like Harlan Schober, who are passionate about supporting Oregon’s farmers and local food system, just as much as it will rely upon ranchers like Nathan Moomaw, who are passionate about sustainably raising delicious and nutritious food for Oregon eaters. iFarm Oregon is one tool for addressing this impending land crisis. To find out more about iFarm, Oregon’s landlinking program, view our online database of landholders and landseekers at http://oregonfarmlink.org, and email farmlink@friendsoffamilyfarmers.org. In 1981, Richard and Joyce Stanley bought 10 acres of farmland in Ashland, Oregon. They had been working in East Africa to develop in rural development and alternative energy project. This work took them overseas constantly and the Stanleys knew they would need a farm that didn’t require the constant care of raising vegetables or livestock. So they decided to transform their new grazing land into a tree farm; trees, thankfully, require little maintenance. The Stanleys welcomed a bridge between their conservation work overseas and their new tree farm in Southern Oregon. Over time they formalized their commitment to conservation by starting the Legacy Foundation and focusing mainly on training in biomass briquette production. Find out more about their love of trees by reading about their project with the Legacy Foundation. However, not every new tree seedling took root on Karibu Farm and Joyce and Richard found themselves with extra farmland. That’s where Oregon’s agricultural landlinkink program, iFarm, came in. After hearing about iFarm through the Ashland Farmers’ Market, Joyce and Richard placed an ad for their unused land. After a month, they received a response from Jake Hayes, a local Ashland farmer looking for his own plot. In 2009, Jake signed a contract with the Stanleys to lease two acres of pasture. 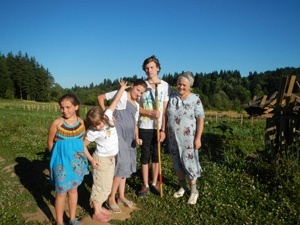 “Our connection worked because Jake came to us with a well thought out business plan,” explains Joyce Stanley, “and a strong and obvious commitment to establishing a well-designed and functioning small farm set-up.” Jake was also a good fit because, unlike many other iFarm applicants, he didn’t require housing, which was unavailable on the property. The Stanleys have renewed their contract with Jake every year and the relationship continues to benefit both parties. Joyce and Richard are currently working with communities in Guatemala to protect forests and are very happy to know that their land in Ashland is, as Joyce says, “being used to its fullest.” Jake will most likely expand his farm next year to incorporate one more acre of Karibu Farm into his operation. The relationship, Joyce and Richard explain, will be a lasting one. Ken Cairns bought his land in Sherwood, Oregon when his daughter was born. He grew up on his own ranch located between Ashland, Oregon and Yreka, California, and wanted his child to live on open land too, surrounded by animals. Ken remembers how much his daughter loved her horses—in fact, she didn’t want to give them away when she left for college. Ken still keeps her horses in the old stable while she’s at graduate school. “You want some horses?” He asks jokingly. Four years ago, Ken put up one-fifth of his land for lease to a farmer on iFarm. He was looking for someone to farm the land responsibly, with a good plan and good sense. Ken had trouble finding a perfect match right away; many people replied to his offer, including farmers with grand ideas but little strategy. But after three years, Ken was able to make a lasting connection with Josh Johnson of Finnegan Cider. Josh discovered iFarm when he decided to grow cider apples. Josh remembers pressing apples at an orchard in California when he was a kid and attributes much of his love of cider to these sensory memories. So when Josh’s wife got him his first cider press 15 years ago, it didn’t take long before they decided to enter the profession of cider-making. They called their business Finnegan Cider, after Josh’s wife’s side of the family. Finnegan Cider uses English and French variety cider apples instead of dessert or eating apples, because they offer a high-quality flavor. But over time, finding the right apples—or enough of them—became a struggle. Josh heard about iFarm through Bull Run Cider, a cidery that found its orchard through an iFarm connection as well. 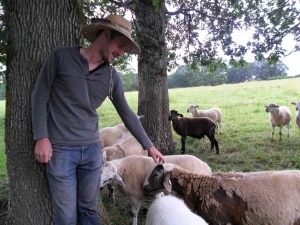 Bull Run Cider’s success on iFarm inspired Josh to try the program too. Having never farmed before, Josh suddenly found himself reading stacks of academic papers on orchard-management. After a few mismatches for Ken, Josh’s enthusiasm and pragmatic approach to farming was a clear selling point. Through iFarm, Josh was able to sign a 10-year contract with Ken, which gives his orchard a chance to grow over time. Just as astounding as his physical dedication, is what Josh did before iFarm….which didn’t include farming. He grew up in the suburbs of California, with no agricultural influence but his love for the local apple orchard. Josh practiced medicine and he now works as a physician at Providence Newberg, but recently requested three consistent days off per week to spend on his orchard. After spending four years farming in Damascus, Ore. as a part of Mercy Corps Northwest’s refugee farming program, Russian immigrants Tatyana and Petr Puzur were ready to take another step toward self-sufficiency, but they needed land where they could continue to build their Happy Moment Farm and further increase their experience. During their time with Mercy Corps, the Puzurs established a market for their produce, which features many specialty crops for the Russian community, at the Lents International Farmers Market. It was at Lents market where they talked with market manager Sarah Broderick about what might be possible for them in terms of finding new opportunities. Sarah was aware of Friends of Family Farmers’ iFarm program so she contacted iFarm Director Nellie McAdams to find out if iFarm could help Tatyana and Petr locate land that would enable them to continue farming. At roughly the same time the Puzur’s began looking for farmland, a new farm incubator program was being created by the East Multnomah Soil and Water Conservation District (EMCSWC). The new program, called Headwaters Incubator Program, was beginning to look for its first group of farmers. So Sarah and Nellie contacted Rowan Steele, Farm Incubator Manager, to discuss the possibility of signing up the Puzurs and fellow Russian farmers Olga and Vladimir Stadnikov, Petr’s sister and brother-in-law. Tatyana shares that the future plan for their Happy Moment Farm is to continue to study and improve their organic practices and soil stewardship. And she strongly believes that other farmers looking for land should contact the iFarm team because of their knowledge, connections, and experience. From Rowan Steele’s standpoint, iFarm did a great job of bringing farmers to him who met his requirements of experience, established markets, and an existing support network, as well as going the extra mile to help Tatyana and Petr put together a useful business plan. Three years from now, when Tatyana and Petr have completed their four-year stay at the Headwaters incubator farm, Rowan believes the Puzur’s business plan — if they keep it up and continue to refine it — will make it much more likely for them to qualify for any capital or loans that might become available. And no doubt, they all will be contacting iFarm again to help Happy Moment Farm transition to its next location and hopefully its permanent home. Andrea and Taylor Bemis of Tumbleweed Farm sowed their first seeds in a modest parcel just over an acre and just under majestic Mt. Hood. This plot is the front yard of Patrick and Revelyn, who set their roots in the valley back in 1985. “It’s not about where you’re born that’s important…it’s about where you choose to live and call home,” explains Revelyn. The decision to nest under the protection of Mt. Hood is obvious; their view and surroundings make you forget about where you’re going or where you’ve been. Taylor grew up on Hutchins Farm back East. His interest in growing didn’t truly transpire until adulthood when he and Andrea decided to move from Bend, Oregon back to the farm in Massachusetts. After four seasons growing with Taylor’s family on 30 acres of mixed veggies and 10 acres of orchards, the couple were ready to head west once again. Familiar and fond of the Hood River Valley, they settled and began the process of starting a farm. First step, and often the most challenging, is land acquisition: enter iFarm Oregon. 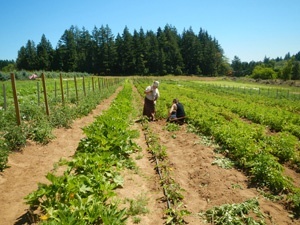 A tip from a staff member of Gorge Grown Food Network introduced the young couple to iFarm. The Bemis couple arranged property viewings with three different landholders, but they canceled the last two after meeting with Revelyn and Patrick. The two families reached an agreement that involved Andrea and Taylor farming the land (just over an acre) that, up until two years prior, Patrick and Revelyn had used for animal pasture. Patrick and Revelyn farmed their land for self sufficiency, and began growing vegetables two years ago to compliment her catering business. But with full time jobs, Revelyn and Patrick decided to let someone else farm the plot. It has been a joy to see the land farmed without having to bear the labor themselves. Revelyn located iFarm on an internet search. She completed the questionnaire and was contacted by Taylor and Andrea shortly thereafter. The Bemis’ were the first iFarm landseekers to visit the property in Mt. Hood, and a mutually beneficial arrangement was formed. “Without iFarm, we would not have had any other reason to connect with Andrea and Taylor,” Patrick stated. Check out Tumbleweed’s Blog here.